From left to right: Blanca Jimenez-Cisneros (Director, Division of Water Sciences, UNESCO), Hubert Savenije (President, IAHS), Demetris Koutsoyiannis (IHP/Dooge medallist) and Bruce Stewart (Director, Climate and Water Department, WMO) (Photo by Wovencontent). Demetris Koutsoyiannis is Professor of Hydrology and Hydrosystems at the National Technical University of Athens (Greece). During his distinguished career, Demetris Koutsoyannis produced an excellent publication record, including 91 papers in international scientific journals (ISI indexed), 6 books (4 of which are textbooks), 291 publications in conferences and workshops, and 25 series of lecture notes. Professor Koutsoyiannis focused his career on improving our comprehension of the random behaviour of hydrological and climatic processes, often by courageously tearing down outdated or flawed ideas and rebuilding sections of the discipline anew. His work has addressed problems in frequency analysis of extreme events, trend analysis, disaggregation modeling, characterization of rainfall data, evaluation of model reliability and robustness, coupling of hydrologic models, the role of entropy in hydrologic systems, and, most recently and importantly, interpretation of time series corresponding to long-memory processes and their scaling behaviors. The vision of Prof. Koutsoyiannis was excellently conveyed by the Darcy Medal lecture he gave at the 2009 General Assembly of the European Geosciences Union, where he showed the connection among chaotic dynamics, uncertainty, and predictability for environmental processes. It demonstrates that Demetris Koutsoyiannis is an interdisciplinary, open-minded and forward-looking scientist. He introduced the idea of applying the Principle of Maximum Entropy to explain the seemingly peculiar behavior of geophysical processes, such as: the saturation pressure curve, long-term persistence, fluctuations on large scales, clustering, state and time scaling, and heavy distribution tails. His 2005 contribution on “Uncertainty, entropy, scaling and hydrological stochastics” provided an illuminating theoretical development, where the Principle of Maximum Entropy was used to explain the scaling properties of hydrological processes. Long-memory processes, also known as the "Hurst Phenomenon," present a special theoretical and practical problem in climatic time series analysis. The physical basis for Hurstian long memory continues to elude complete explanation. Demetris Koutsoyiannis tackled this challenging research question with 60 contributions, finally providing an illuminating physical interpretation, which ascribes the Hurst phenomenon to non-linear interactions among changes occurring at multiple time scales. His 2013 paper “Climatic variability over time scales spanning nine orders of magnitude” presents these findings by analyzing the natural variability of past climate, as seen from available proxy information, and its attribution to deterministic or stochastic controls. It presents real discoveries on the intrinsic non-linear dynamics of climate processes and their connection with uncertainty. Demetris Koutsoyiannis also elaborated new ideas for the analysis and representation of the non-linear properties of rainfall, thereby enhancing our capability to provide a probabilistic description. These ideas are presented in 19 publications spanning from 1994, when he proposed a stochastic disaggregation method for heavy storms, to 2013, when he published a global survey of extreme rainfall series to assess emerging patterns. His paper published in 1996, “Deterministic chaos versus stochasticity in analysis and modeling of point rainfall series” makes an excellent case for the use of stochastic non-linear models for simulation purposes. Demetris Koutsoyiannis exhibits extraordinary enthusiasm and passion for hydrology in all of its forms, with a particular emphasis on the study of non-linear dynamics and the integration of stochastic and physically-based methods to advance our understanding of hydrological processes. His research has challenged widely held beliefs, yet it has stood up to scrutiny. Prof. Koutsoyiannis is a true intellectual leader in the field whose contribution to hydrological research has been recognized worldwide. Finally, Prof. Koutsoyiannis is a delightful and brilliant speaker and a very amiable person. 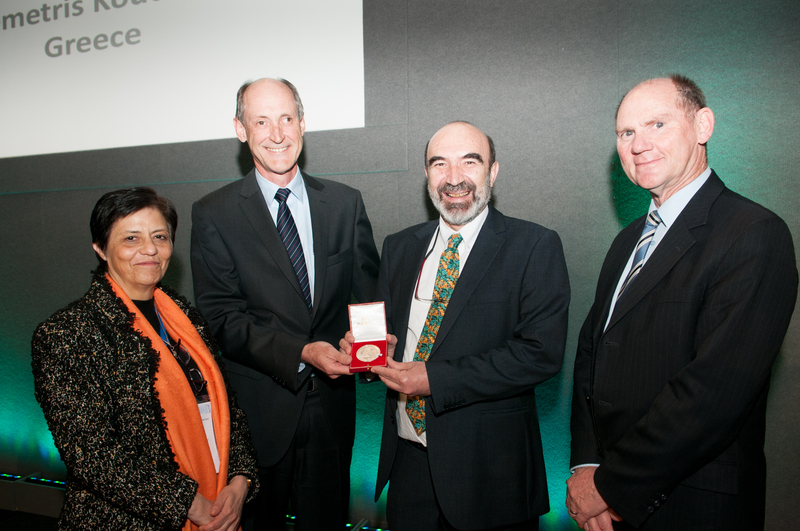 I am delighted to award to Prof. Demetris Koutsoyiannis the 2014 Dooge Medal on behalf of IAHS/UNESCO/WMO, for his lasting contributions to hydrology as an Earth science and his fundamental contributions to the theoretical understanding of the long-term behavior of hydrological, climatic and meteorological processes. It is an ineffable joy and honour for me to receive this award from IAHS, UNESCO and WMO today, in front of this esteemed audience. 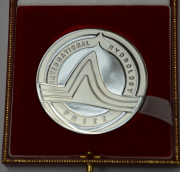 The colleagues listed as past winners of the International Hydrology Prize are among those who wrote the history of modern hydrology and this shows how prestigious the award is. As mentioned by Hubert, it happens that I am the first recipient of the Dooge medal. The award ceremony is held in Dublin Castle in the context of a conference about the seminal roles in Hydrology of Jim Dooge and Eamon Nash, who were among the first winners of the International Hydrology Prize. With all this in mind, my feelings of delight and pride turn into apprehension and fear that I may not deserve this distinction. I guess some of you may have similar doubts or questions. At this point I wish to thank Hubert who has, in a way, tried to address these questions. In his flattering statements about me, he has exaggerated, which is excusable in award ceremonies. I will follow a different approach, perhaps inspired by a talk by Hubert in a similar situation: “the art of hydrology”. I still like this song for several reasons. 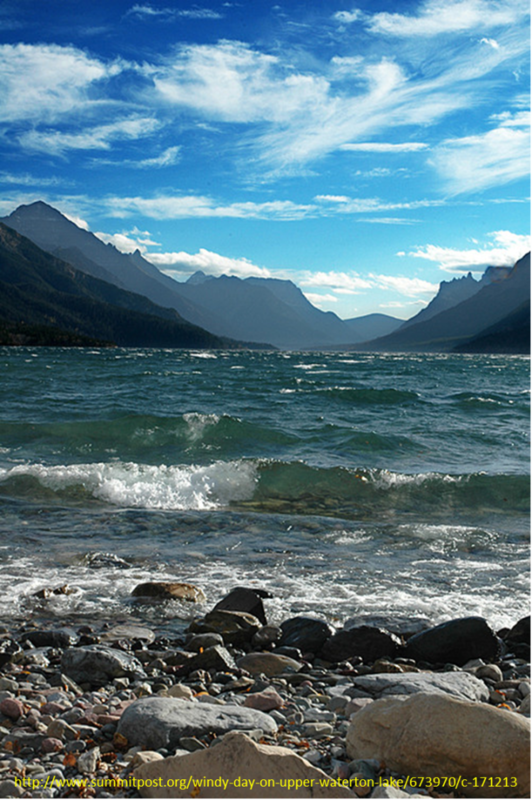 First, it is related to hydrology and hydrometeorology, as it speaks about a lake, its waters and their motion induced by the wind. Second, it says a big truth about the dominance of randomness, both in nature and in life. And third, it reveals an important secret: that knowledge is not only a matter of our mind, as we tend to believe, but also a matter of our heart. Indeed, it is difficult to be open-minded if we are not open-hearted. The song provides all explanations and answers to questions related to my involvement in this ceremony today, and guides me to speak from my heart in a framework of randomness. I will briefly describe how my random walk on water, the main constituent of my professional life, interacted with people in the hydrological community. In other words, I will speak about my personal socio-hydrology; I guess, socio-hydrology is much more pertinent for ceremonies and therefore I will not speak about scientific principles or engineering aspects of hydrology. To make the story short, I will skip about 30 years from the date the song was written, except mentioning my gratitude to my teacher of hydraulics, the late Giorgos Noutsopoulos, and my mentor in hydrology and hydrosystems, Themis Xanthopoulos. In April 1999 I had a presentation in the “Open session on statistical methods in Hydrology” in the EGS Assembly in Den Haag, where I met Alberto Montanari, convener of the session. After my talk, he asked me a question, to which I replied hastily. After thinking more about this question, I was able to generalize and then answer it in a paper, “A generalized mathematical framework for stochastic simulation and forecast of hydrologic time series” published in 2000. In this paper I came across what I later called Hurst-Kolmogorov stochastic dynamics. In the same year, 2000, I was appointed Associate Editor to the Journal of Hydrology. I also submitted to this journal a paper on the Hurst phenomenon, which was rejected outright. Meanwhile, I had prepared another paper on the relationship of Hurst-Kolmogorov dynamics with climate, which I submitted to Water Resources Research. It too was rejected outright. These two consecutive rejections were not the happiest moments of my life, but proved to be among the luckiest—and not only because the two rejected papers were later published and have been my top cited ones. I submitted both rejected papers, one after the other, to Hydrological Sciences Journal. Thus my path crossed with that of its Editor, Zbyszek Kundzewicz, who is not only talented in pinpointing innovative papers, but also a rare personality, making collaboration with him a real joy. He invited me to become Associate Editor of HSJ in 2003, his Deputy Editor in 2006 and Co-Editor in 2009. Our collaboration in HSJ has been full of agreements, with only one disagreement: on climate issues. But his behaviour in disagreement made me admire him more. Soon after their publication, these papers had the good fortune to be read by Tim Cohn and Harry Lins, who cited them in their seminal 2005 paper, “Naturally trendy”, in Geophysical Research Letters. I happened to have been invited to review their paper. Thus, I got to know them and their work and discovered that we share similar interests and views. I owe them a lot and I thank them for their collaboration and friendship. The intense discussions that broke out after the publication of their paper brought me into contact with many people in the climate community and the blogosphere. It was Zbyszek Kundewicz who brought me into contact with IAHS and its sensible and sensitive people. It was very fortunate for me to become a member of this big, worldwide family. The feeling of belonging to it counts much more than scientific achievements. I had the good fortune to serve it under the presidencies of Arthur Askew, Gordon Young and now Hubert Savenije. I thank them for their trust and friendship. For the same reasons I thank the former and current Secretaries-General, Pierre Hubert and Christophe Cudennec. 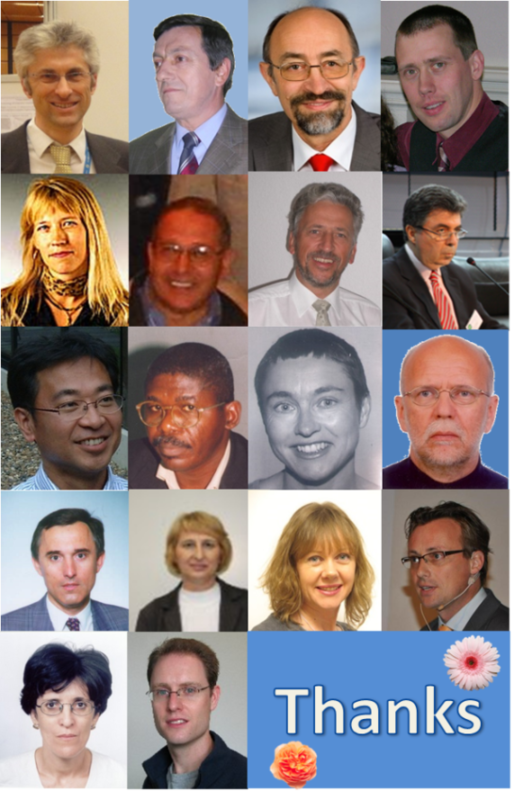 Within the IAHS family, I met many historical figures in hydrology, as well as active officers of IAHS and I am grateful to many of them. I wish to name one, Vít Klemeš, former president of IAHS, former winner of the International Hydrology Prize, former Czechoslovakian, former Canadian and since 2010 permanent resident of Cloud No. 17, as he used to call his last resting place. His attitude, his writings and talks, and our intense discussions, which started in a conference in Monte Verità in 2003 and included a “Socratic dialogue”, as he called it, in Greece in 2005, will continue to be an inspiration for me. Actually, it was one of the two rejected papers which triggered all this rich exchange with Vít, but I now have to stop the story of the two lucky rejections, even though my relationship with rejections continues to be fruitful; for example, last year I received eight rejections from eight different journals for a single paper, but the paper was eventually published. I hope our young colleagues find this story encouraging as it shows that very good things can come from rejections. It also shows that good rejected papers may have a good fortune in Hydrological Sciences Journal. I would also like to mention a tangential contact of my random path with Jim Dooge himself, just 10 years ago, in 2004. He was in the audience of a talk that I gave in EGU in Nice entitled “Simple methods to generate time series with scaling behaviour”. In the coffee break after the talk he approached me to say that he was attracted by my title because during all his life he has been searching for simplicity in hydrology. I am really touched for their support and I am also honoured that my predecessor in IHP, Günter (Blöschl), my Co-Editor, Zbyszek (Kundzewicz), and my compatriot, George (Tsakiris), contributed to my nomination. Finally, I want to acknowledge the long term persistence of the Ιτιά Research Team in the National Technical University of Athens. It has shown that it can perform even without financial resources during a deep economic crisis in Greece. I am really lucky to be a member of this group. Our secret is in the nice and dedicated people, the friendship-based relationships, the diversity and debate of opinions, and the replacement of a pyramid-type academic structure with a flourishing willow tree characterized by dynamic alternation of the roles of teacher and student. In closing, I wish to thank you, Hubert, for your citation, as well as the members of the award committee that you chaired, Denis Hughes, Blanca Jimenez-Cisneros and Bruce Stewart, along with their parent organizations, IAHS, UNESCO and WMO. I thank you all for being here this afternoon with me. Please allow me to address to a special participant of this ceremony, my dear wife Anna, a great thanks for our persistent relationship of love, honesty and modesty, and for our intellectual coevolution.